Mix lime juice, soy sauce, Worcestershire, ginger, both types of pepper and liquid smoke. Dry meat according to your dehydrator. We’ve been selling the best beef jerky here in San Antonio for several years. I sell jerky mostly online and market mostly to the gaming community. If you are looking to purchase our delicious jerky and are located in San Antonio I do deliver or will meet you. You’ll love the best jerky in Texas! I use the best cuts of beef for jerky-making. I try to pick a nice roast with very little fat marbling. My first choice is an eye of round roast. Because we let our meat marinade for 24 hours the result we get is the best flavor. 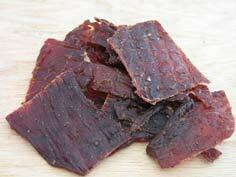 We haven’t been selling beef jerky for very long but we believe we have a great tasting beef jerky. Our jerky is loaded with flavor. With several flavors available Simple Jerky is bound to have a beef jerky flavor that you’ll love. Below is just a few of the flavors available. We love eating and selling jerky! So if you would like us to ship to your office on a monthly basis we can do that.